2006's Babel was considered the final instalment in director Iñárritu's "death trilogy," which began with Amores Perros, then 21 Grams, but Biutiful continues the thematic tradition with this haunting treatise on a man in freefall. 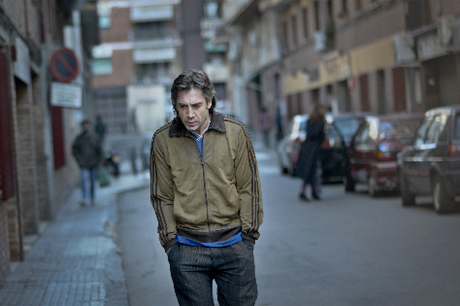 Uxbal (Javier Bardem), a divorced father of two who works as the go-to guy for Chinese and Senegalese human traffickers and counterfeiters in Barcelona, has two months to live. Instead of running off to sandy shores, Uxbal carries on with the harsh brutality of his world in order to save enough money for his children after he's gone. But the dangerous uncertainties of his job cause a torrent of horror he must atone for. Death imagery besot the first act of Biutiful and never dissipates: funeral homes, dead owls, blistering winters, cremations, embalmed bodies and a propane gas leak seeping into a sweatshop. Filmed almost exclusively with handheld cameras, we thusly feel trapped in Uxbal's cramped, blurry, unavoidable downward spiral, which confronts us so ferociously that we dare not look away. Bardem gives Uxbal a quiet, sickened frustration with his pain, only speaking when necessary, as if each consonant wracks his entire body. His suffering is so horrifically tangible in some scenes that when Uxbal sees ghosts of the dead around him, we believe we do as well. Iñárritu also wrote the script (his first since his fallout with long-time collaborator Guillermo Arriaga) and he's made this more than just a look into the grotesque decaying of life; it's also about the two-faced insincerity of the living. Everyone around Uxbal is a duplicitous counterfeiter — some in work (traffickers, corrupt cops), some in love (his cheating wife, closeted sweatshop fixers) — all of them profiting in some fashion from the suffering and misery of others, placating their follies and sin with the mantra "Never trust a man who is hungry." Uxbal, amongst all this, tries to find something real in a world full of fakes. Quite rightly, Uxbal's mirror reflections and shadows refuse to follow his every move, as even they are false.